Over ten years ago, when I first began to blog, I was inspired by Alicia Paulson‘s photography of her everyday life. 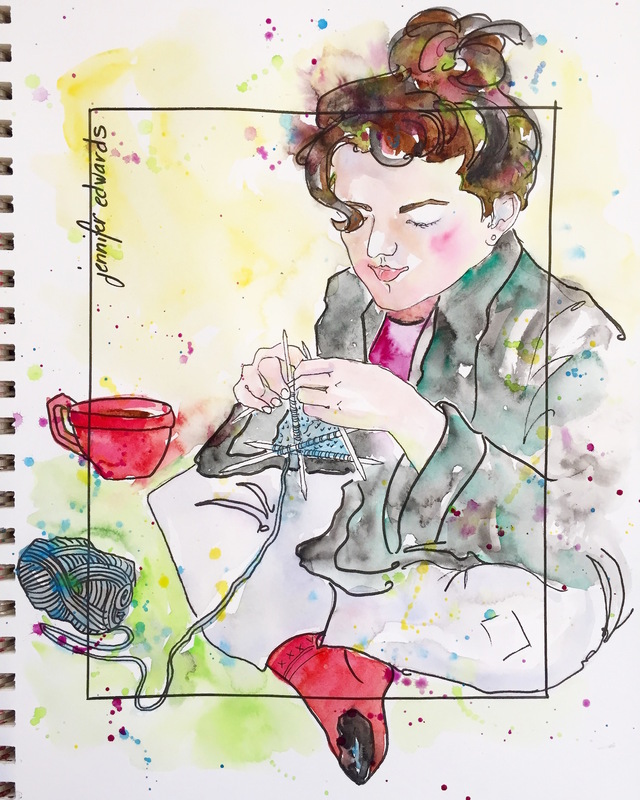 It seems an enchanted life from the viewpoint of her camera lens…walks in the woods, her current stitching projects of all kinds, her home, her cooking. Everyday things, which are indeed beautiful in and of themselves, but made moreso by the art of photography. Her writing was also enjoyable as she chronicled her days, rainy or sunny, chaotic or simple, difficult or restful. I wanted to do the same thing but with sketches and drawings rather than photographs. I’ve been reconnecting with this love of drawcumenting my days. 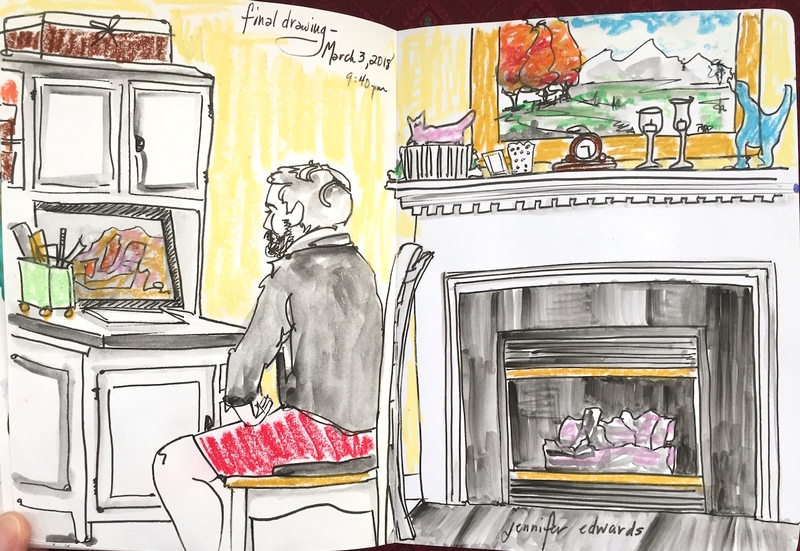 Not that I had stopped drawing in a sketchbook, but I was finding an overwhelm with all that I love to create which crowded out the daily practice of looking for, sitting down, and sketching something in my life. 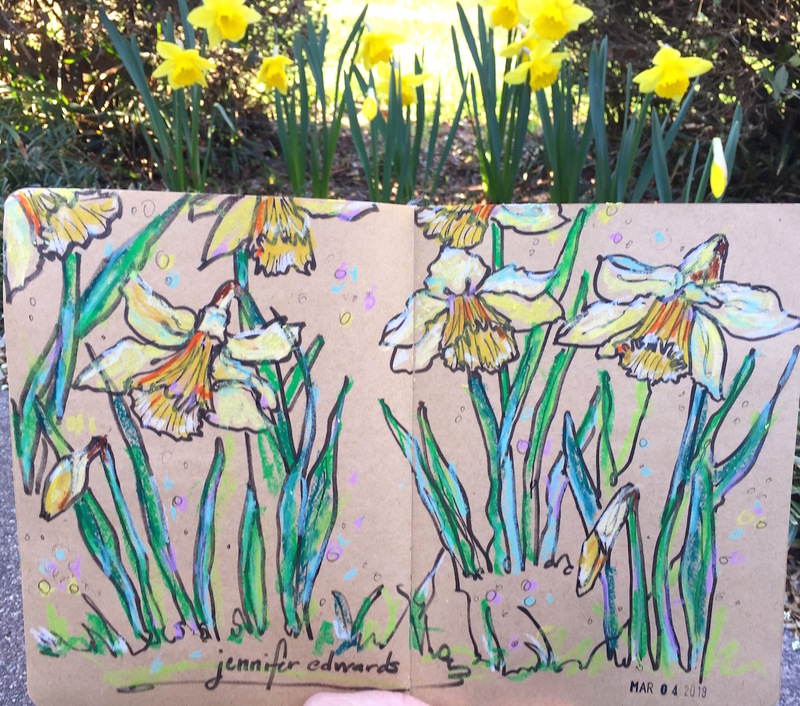 Whether it’s the daffodils blooming along our driveway (below), or the end of the day sitting around the living room while husband works at the computer (first one), or sketching a photo of the knitters and crocheters I teach (second sketch), or the loveliness of my daughter as she learns to knit an intricate pattern …this delights me to no end. I have been in need of some focus. To re-establish what it is that underpins all the creativity, all the mothering, the wife-ing, the teaching, etc. Drawing my life in a sketchbook is how I can see it all for the beauty it is, no matter how hum-drum or exciting it may be. Following a line through my days works to help anchor me and provide insight into what’s going on underneath it all, in and through it all, and sometimes even despite it all. It is a documentary of sorts, but drawn through a pen, a brush, a sketchbook. I have just finished an entire sketchbook! I love looking back through it for all that it contains from the date written on the very first page. I am aware that I have jumped around to several other sketchbooks. large and small, for more drawings and sketches of life, but when one is filled up to the very last page, I feel a wistful contentment…herein is a life of love. Go to my Instagram feed to see a very quick flip-through of this sketchbook. The above drawings of knitters around the table and of my husband at the computer are the final two drawings in this book. The video cut off right before these last two sketches. I have a couple of sketchbooks to choose from to begin another. They are what I call “good sketchbooks”…you know, the more costly kind with paper thick enough for watercolor, pen and all kinds of media. The sketchbook I just finished, with its tons and tons of pages, was very cheap! Same with this brown kraft paper sketchbook. Both bought at Walmart, they contain fairly sturdy paper, but it does buckle and warp, something I don’t mind too much. In fact, a cheap sketchbook can be very freeing! I also loved the really white paper of the first one! 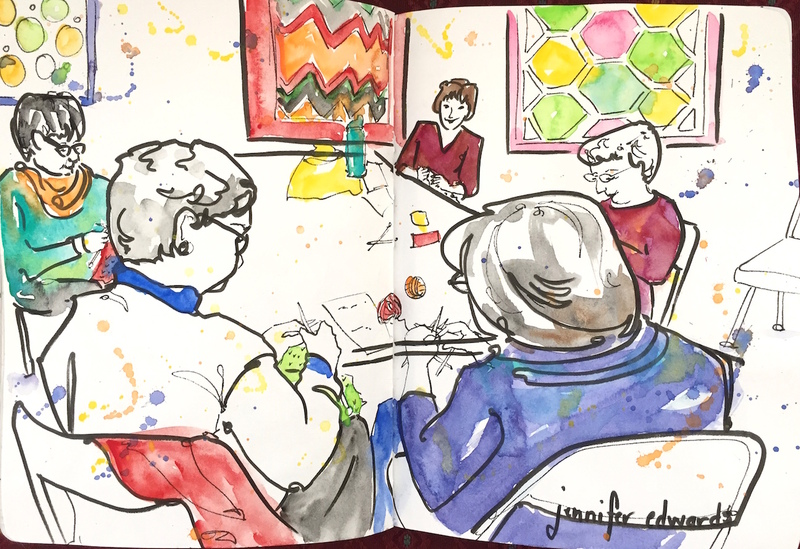 White paper makes watercolor sparkle and fineliner pens stark and clear. I’m not terribly crazy about the brown kraft paper, but it’s fun to switch to every now and again. I’m hesitant to start drawing in my Handbook Journal because the paper is cream colored. However, even though I liked the white pages of the cheap book, it was difficult managing the bulk of so many pages not laying flat for a drawing across both pages. That is my favorite way to draw – covering both pages at one go. So I’ve ordered a Stillman and Burn sketchbook because I’ve heard that the pages lay open very flat. We shall see. There are only 26 pages in one sketchbook so that won’t last me very long. I’ll just keep on searching for the perfect sketchbook. If you have a favorite, do share it with me! I am particularly in search of bright white paper, thick enough to handle watercolor, and pages that lay somewhat flat. I hope you can drawcument your day through the lens of your sketchbook! Draw on my friends…draw on! Take a look at the Pentalic sketchbooks. They have a variety of sizes for watercolour.